Last time, we touched on the Phonic Summit and Presonus StudioLive. Both are small-format consoles suited for small installations, recording or portable systems (which is one of my interest at the moment). But I'm also looking at a FOH console. I'm leaning heavily towards to Digidesign Profile; which I had hoped to play with at NAMM. No luck however, as Digi didn't bring any consoles to the show. Bummer. In the effort to keep an open mind, I wanted to check out the offerings from Soundcraft and Allen & Heath. I've heard a few good things about both, and was interested in checking them out. First up, A&H. The iLive T-Series has been specifically marketed towards church installs.The iLive T-Series is the "more affordable and accessible" part of the iLive line. It's a control surface/mix rack design that distributes audio and control. The system is highly flexible and comes a wide variety of configurations. There are two mix racks to choose from that differ only in I/O count (32x16 and 48x24). Both have significant DSP capabilities on par with comparable digital systems, including dynamics on every channel, 8 FX engines and 32 mix busses. There are also two control surfaces, the 80 and 112. The 80 has 12 input and 8 output faders; the 112 adds an additional 8 input faders, as well as dedicated rotary encoders for the gate and compressor not included on the 80. One thing that is appealing to the iLive system is the Mini Multi Out card. It provides 25 channels of ADAT output, two 8 channels iDR/HearBus outputs and a 16 channel Aviom output. All at once. All fully patchable. Other companies should follow A&H's lead on this front. It only takes a few chips to make that happen, and it's nice to finally see it all combined on a single card. Props for that one. When it comes to the control surface, I was less impressed. The channels strips do have color-coded scribble strips with cool, curved meters and status indicators, which are nice. And there are dedicated rotary encoders for EQ and head amp, also nice (the 112 also has encoders for dynamics). However on the 80 control surface, once we got into the dynamics section, the only way we could figure out how to adjust parameters was drag little dots around the touch-screen surface. That was a lot less than precise. Maybe there was a way to get the compressor to the rotary encoders, but three of us standing there couldn't figure it out. When it comes to digital consoles, I'm willing to put up with a learning curve; however, there are a few things I feel like I should be able to walk up and do quickly, with no instruction. Head-amp, EQ, dynamics and phantom power as well as basic routing fall into that category. If a console makes me hunt too long to figure that out, there is an issue with the ergonomics. Overall, the T-Series is an interesting concept. There is a lot of power in a fairly affordable package. However, I think if I were leaning toward A&H, I would look at the full-fledged iLive consoles simply because of the work surface. The T just leaves a few too many things off the panel. But that's just me. The most notable feature of the Vi4 is the screen.I've been curious about the Vi series since it came out. 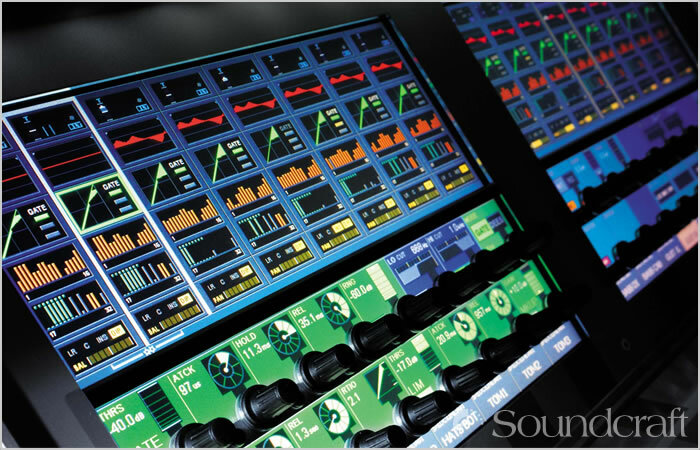 I've always like Soundcraft desks (except for their older power supplies), and I was intrigued by the encoders right on the screen. Soundcraft took the route of Digico and Midas with the Vi series; that is, each bank of 8 faders has a monitor associated with it. Moreover, the rotary encoders stick right out of the screen (the top half of which is touch sensitive). The Vi line has several offerings; we looked at the 4 which has 24 input and 8 output faders. The first thing you notice about the Vi4 is the screens. They look great. At a glance, you can quickly see input settings, EQ, various output mix levels and access to parameters with rotary encoders. If you want to edit, say the EQ, push the EQ graph on the touch screen and it pops up on the monitor. Tweak away. It's very intuitive and fast. One area the Soundcraft really excels is in color-coding. The slots the faders travel in glows to indicate what mode each fader is in. The screens change color to correspond to the function being accessed. Even the scribble strips change color. There is a lot of functionality provided by dedicated buttons. There is extensive copy/paste abilities, though not all of it is implemented in software yet. In fact, that was the one real drawback; it seems as if the hardware is done, but the software is still growing up. I've heard anecdotally of a few instances of a Vi crashing, and there were a few times when the rep said, "That's coming soon..."
Still, it's an incredibly powerful system with a lot of well thought-out features. This is a desk you could walk up to and start mixing quickly. And as you spend time with it, you would learn the real power of the system. For example, we merely touched on the snapshot function; but it looked very comparable to my current standard of snapshots, the Venue. So I think Soundcraft is on to something here. Next up, we'll get to the DPA mics. I promise!